Still immersing yourself in the beautiful background music from DVD movie? Wanna play DVD music with mp3 player like iPod anywhere anytime? Now you might need a DVD to MP3 Ripper to extract background music off DVD and convert DVD to MP3 file. 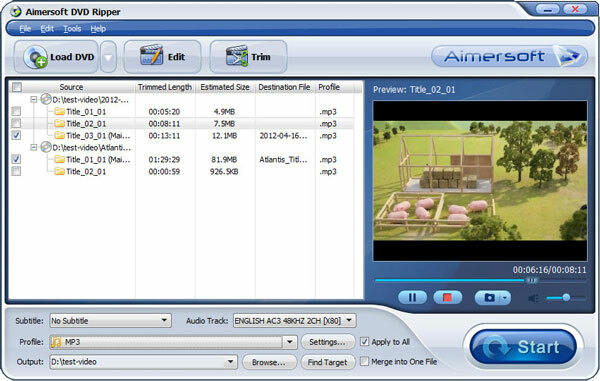 Aimersoft DVD ripper tool is a professional DVD converter that can easily extract mp3 audio from DVD with fast speed and good quality, and you can rip any segment, set output file size/time. What's more, it also support rip DVD to M4A, AC3, AAC, WMA, WAV, MKA, OGG. For Mac users, Aimersoft DVD extractor Mac is an ideal tool to rip DVD to MP3 on Mac, including Lion and Mountain Lion. Free download the right version of the DVD to MP3 ripper and listen to any DVD on your iPod! Action now! Insert your DVD disc into DVD-Rom, then run the program, click "Load DVD" button to load DVD movie to the program. Tick the chapter you want to rip, and click "Clip" button to customize the time you specially needed. You can entry start and end time by manual. From the drop-down list of "Profile" at the bottom, choose "Common Audio > MP3 - MPEG Layer-3 Audio (*.mp3)" as output format. Once you are satisfied with you choices, click the "Start" button to begin the DVD audio ripping. Minutes later, you will get the converted MP3 files from this DVD to MP3 converter on your computer, import them to your iPod and now enjoy the MP3 music anytime anywhere you like! Here is the video tutorial on converting DVD to MP3.